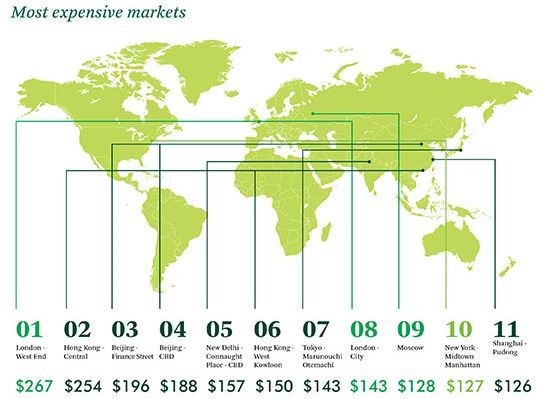 Real estate advisory firm CBRE has just released their latest research for global prime office space rates, and as per the findings, Connaught Place, New Delhi has emerged as India’s most expensive and World’s 5th most expensive location for having an office. Mumbai’s Bandra Kurla Complex is ranked 15th in the list. Last year, Connaught Place was ranked at #8 with average price of $150 per square feet/ annum, which has increased to $157 per square feet/annum this year; thereby climbing 3 spots in the list. BKC was ranked #15 last year as well; however the rates per square feet has increased to $102 this year, compared to $97 last year. Nariman Point in Mumbai, which was ranked #32 last year, has also improved its position to #30 in this year’s list with average rates of $76 per square feet/annum. London’s West End, has maintained it’s position as World’s most expensive office space with an average cost of $267 per square feet/annum, which is the highest in the world. Hong Kong Central area is again at #2 position, which was same last year. Similarly, Beijing’s Finance Street is at #3, and Central Business District in Beijing is at #4 rank. Their position have remained same since last year. Moscow in Russia, was placed at #5 last year, which has slipped to #9 this year, as the real estates rates have fallen considerably since the Ukraine mis-adventure. Honk Kong’s West Kowloon is at #6, Tokyo at #7 and London Central is at #8. New York’s Manhattan is placed at #10 this year, replacing Paris which was at the same position last year. Shanghai, Moscow and Paris are the three regions which have dropped out of the top 10 list, making way for Connaught Place to climb 3 spots, London Central and New York’s Manhattan. 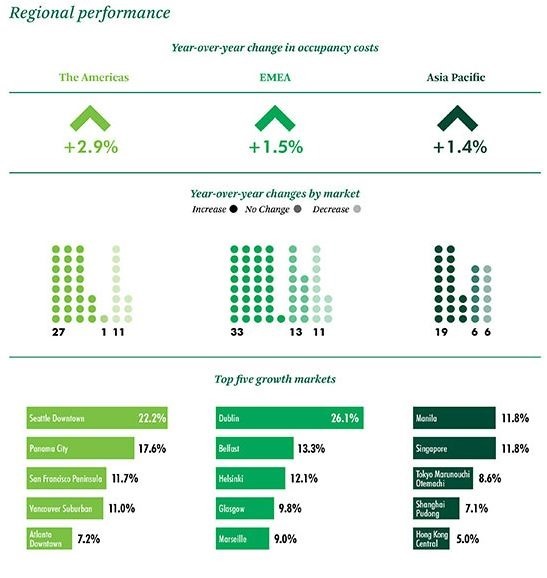 – Out of 79 markets which witnessed increase in rates, 9 markets increased the rates by more than 10%. Dublin, Seattle (downtown) and Panama City were the top three markets where the real estate rates increased. – Moscow and Buenos Aires had double digit dip in real estate rates. "Connaught Place Is India’s Most Expensive & World’s 5th Most Expensive Office Market Space", 5 out of 5 based on 1 ratings.